Rinse and then soak the Cannellini beans several hours. I soaked them overnight, but 2-3 hours before cooking will work. Drain the water before cooking. Saute the onion in two tablespoons of olive oil and butter on medium heat for a few minutes until the onion has browned. In a crock pot, or large pot on the stove, add the beans, sautéed onion, potato and veggie broth. Add in the herbs, just a pinch of each will work. Beans take on the flavor of whatever they are cooked with, so you want to be careful how much seasoning you use. You can always add more later. Bring to a boil and then reduce heat to low and cover. Allow beans to simmer for 2-3 hours, the liquid should reduce but not completely. Add water if needed. Once the beans and potato have softened, transfer the beans to a food processor with a slotted spoon and blend. Leave the liquid in the pot, but add spoonfuls of it to the mixture as you blend to achieve the desired consistency. As the beans become a creamy pureed texture, add salt, pepper and olive oil to your taste preference. Remember, with beans don’t add the salt until you are done cooking or it will slow down the cooking time considerably. 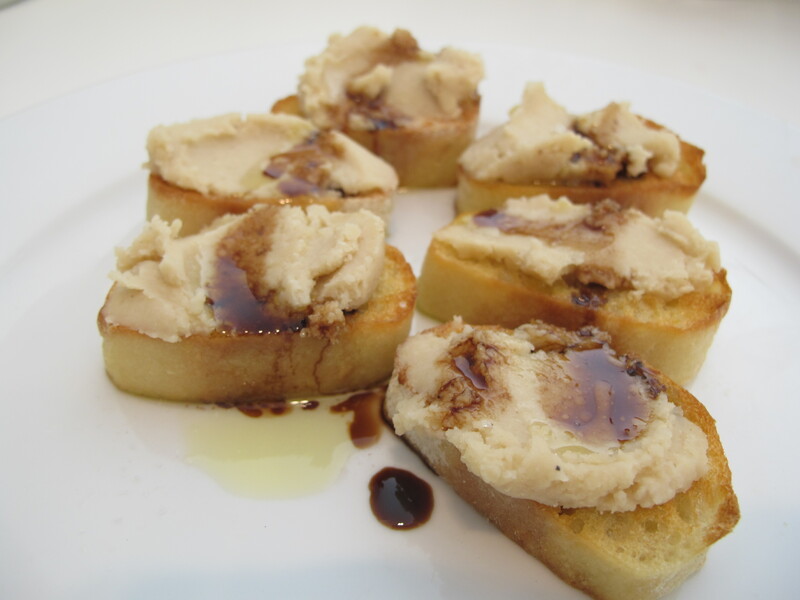 I served the puree over toasted sour dough bread and then drizzled olive oil and balsamic vinegar over the top. Break out the expensive balsamic vinegar for this one, you know, that really thick aged one that you are saving. Only a few drops will do, but it works beautifully. I am thinking next time I will top it with a few crispy sage leaves. Just sauté a little garlic in olive oil or butter and then add sage leaves and cook until they are crispy, about 2-3 minutes. Transfer them to a plate covered in paper towels and then allow them to cool before serving. A little sea salt on top works too. Yum! White beans are my new favorite thing. I just got some fig balsamic reduction. I bet that would be delicious on this! My favorite white bean recipe lately is here, if you’d like to see it. Thanks, Kate! One day I was like “am I just going to talk about wanting a bulldog for FOREVER or what?” And it’s been one of the coolest things I’ve ever done. Thanks! I am betting she will. Aidan loves them. Let me know what she thinks!